Aishwarya is the guest of honour at a special evening celebrating 100 years of Indian cinema. Exactly a year after facing criticism for her drastic weight gain post pregnancy – a much slimmer and new mom Aishwarya Rai Bachchan was back at Cannes for her 12th appearance. Aishwarya Rai,who was dressed in a black outfit worn with yellow shoes,was seen coming out of the airport at Nice,with her 18-month-old daughter Aaradhya. Last year,Aishwarya’s shape five months after she gave birth to Aaradhya had generated unusual public interest with the Bachchan bahu coming in for some criticism for the ‘oodles of weight’ gain. 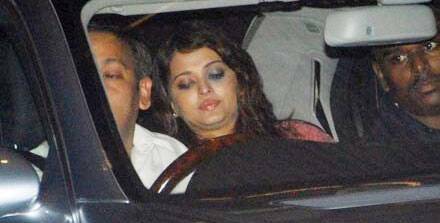 The trigger for the reactions came following the publication of some pictures of the former Miss World while emerging out of a party hosted by industrialist Mukesh Ambani in Mumbai. The pictures set off a buzz on the internet and in the social media with articles,videos,blogs and tweets highlighting her ‘oodles of weight’,’double chin’ and calling the photos of the beauty queen ‘shocking’. A video was also uploaded with a compilation of her post pregnancy photos. Aishwarya’s look at the Cannes have always been under the scanner and reports suggest that the former Miss World could opt for a sari this year. Not concerned about the fashion critics,a bold Aishwarya Rai showed off her plus size figure in a blue Elie Saab at the 2012 Cannes.